This year went the army from Repton; and Healfden advanced with some of the army against the Northumbrians, and fixed his winter-quarters by the river Tyne. The army then subdued that land, and oft invaded the Picts and the Strathclydwallians. 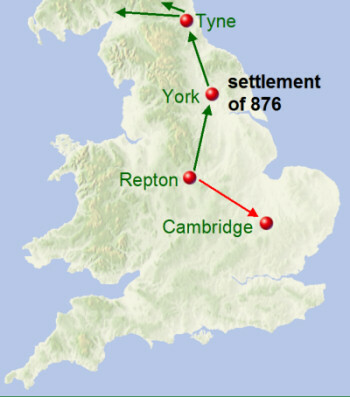 Meanwhile the three kings, Guthrum, Oskytel, and Anwind, went from Repton to Cambridge with a vast army, and sat there one year. This summer King Alfred went out to sea with an armed fleet, and fought with seven ship-rovers, one of whom he took, and dispersed the others.